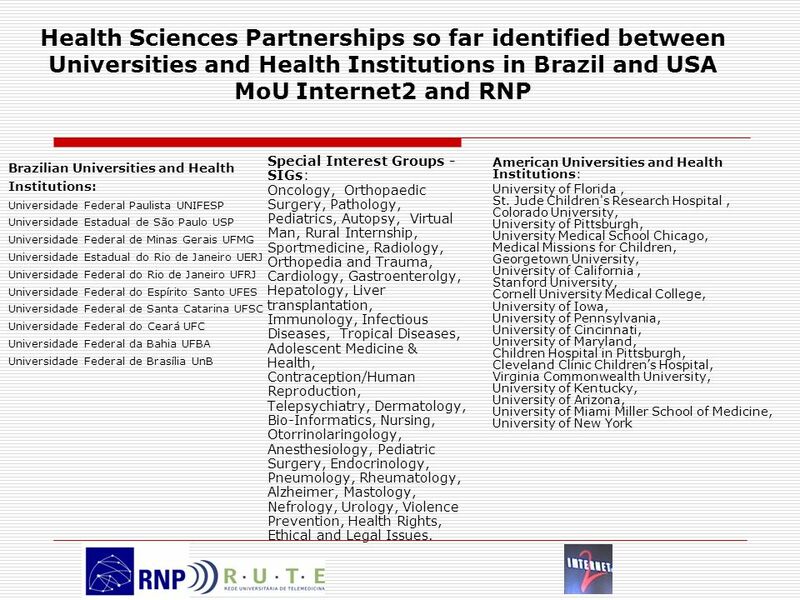 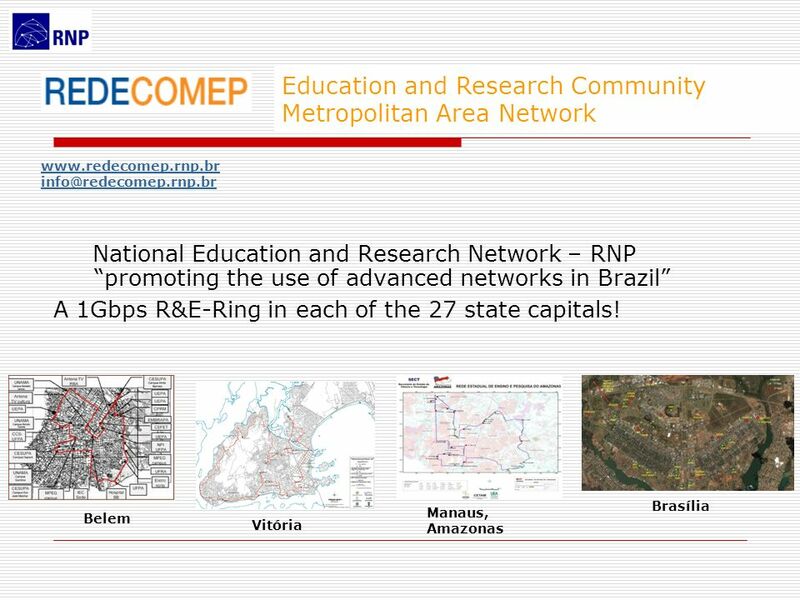 RedCLARA Rede Nacional de Ensino e Pesquisa (RNP) is a not-for-profit corporation incorporated under the laws of Brazil that interconnects over 350 education and research institutions, helping an estimated public of over a million users, and linking all the Brazilian regional academic networks. 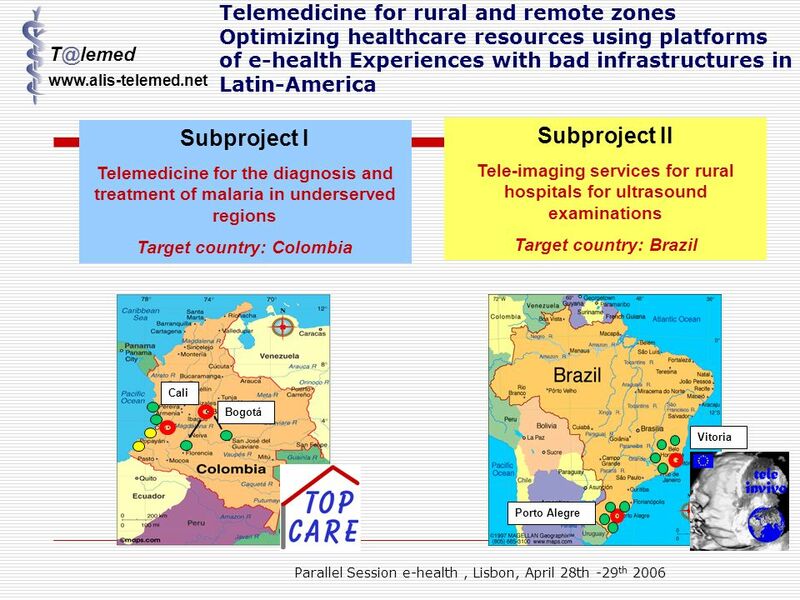 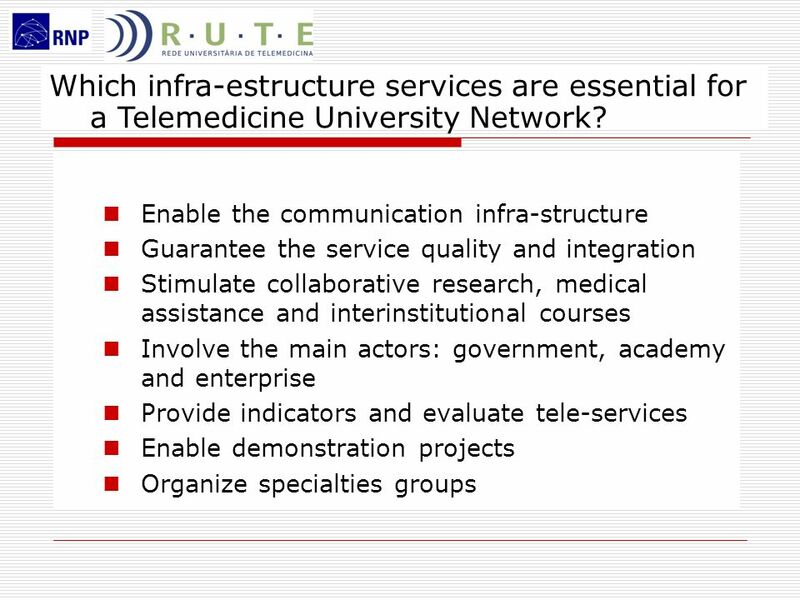 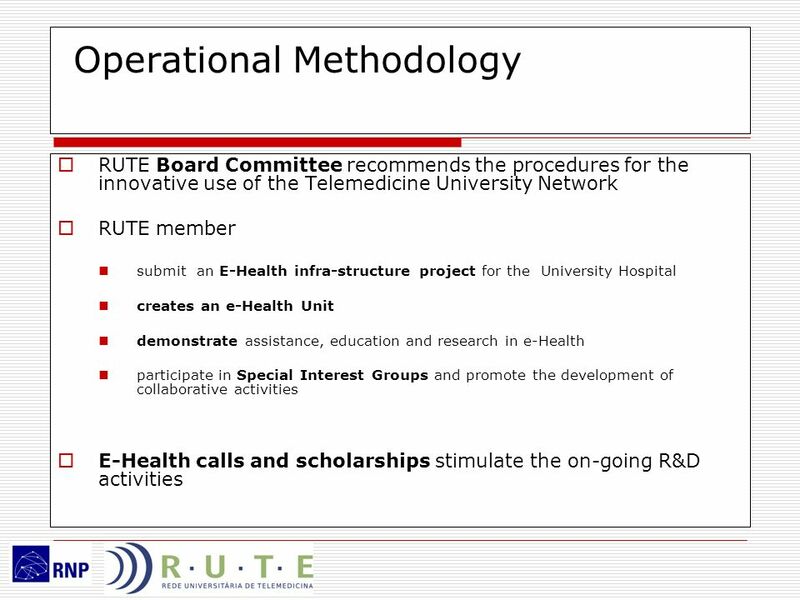 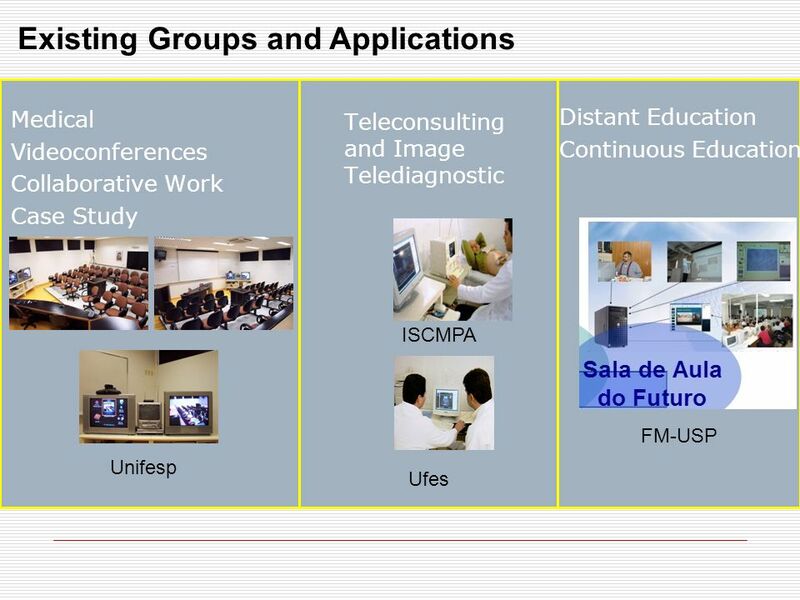 6 Which infra-estructure services are essential for a Telemedicine University Network? 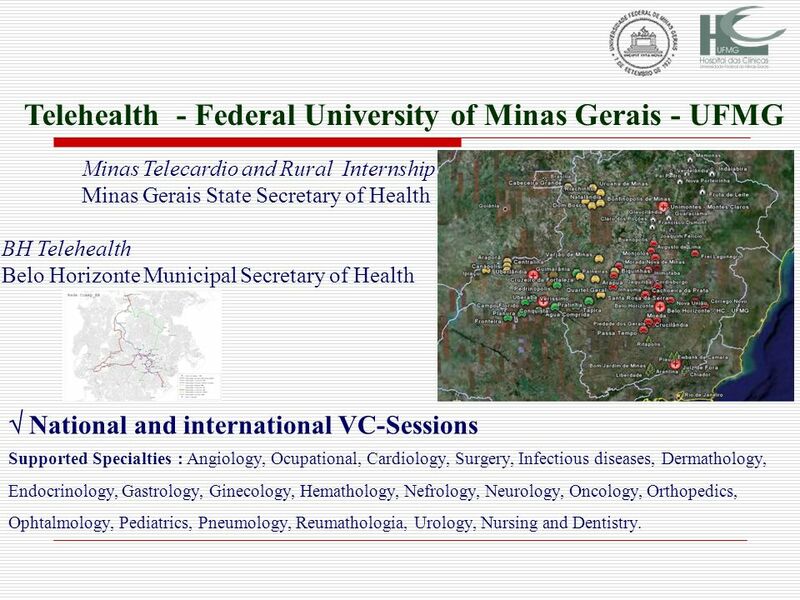 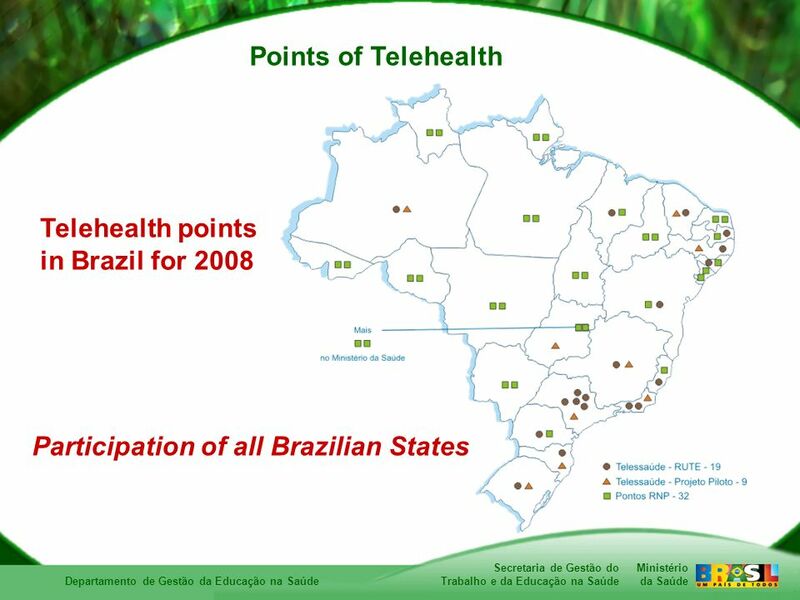 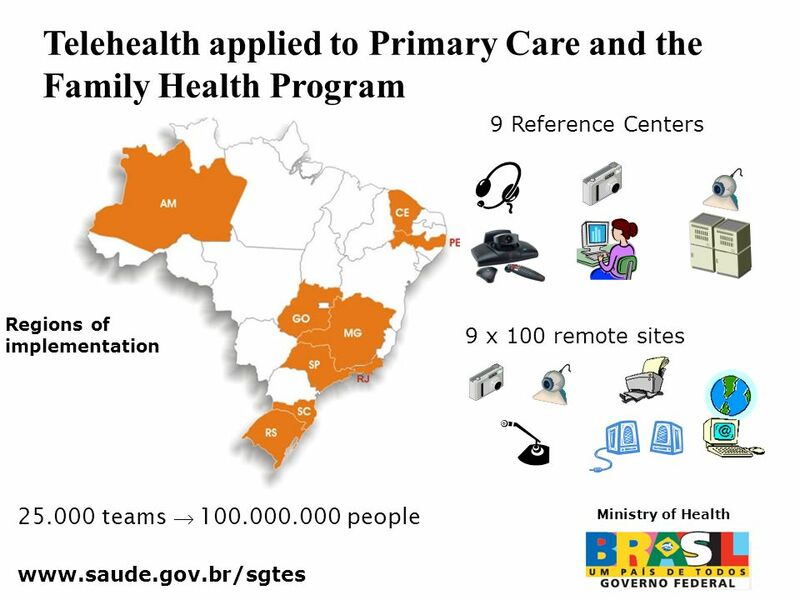 Minas Telecardio and Rural Internship Minas Gerais State Secretary of Health BH Telehealth Belo Horizonte Municipal Secretary of Health  National and international VC-Sessions Supported Specialties : Angiology, Ocupational, Cardiology, Surgery, Infectious diseases, Dermathology, Endocrinology, Gastrology, Ginecology, Hemathology, Nefrology, Neurology, Oncology, Orthopedics, Ophtalmology, Pediatrics, Pneumology, Reumathologia, Urology, Nursing and Dentistry. 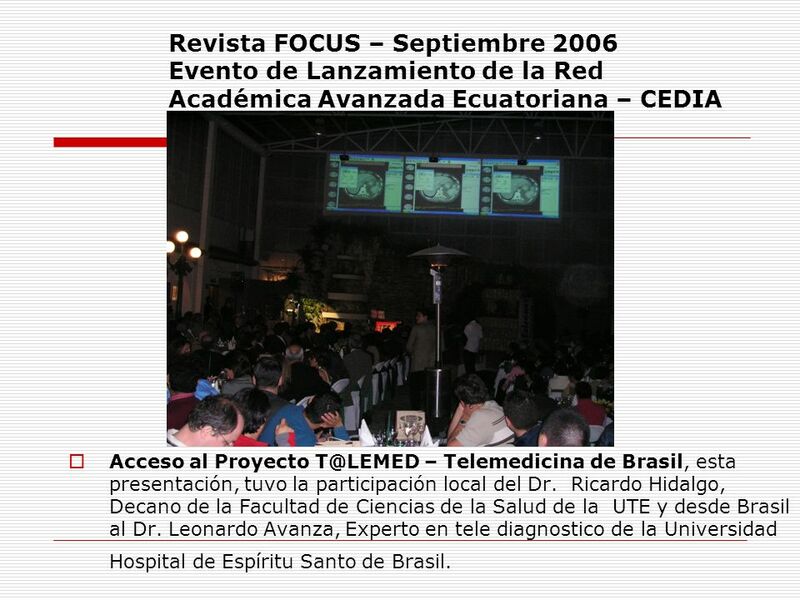 14 Revista FOCUS – Septiembre 2006 Evento de Lanzamiento de la Red Académica Avanzada Ecuatoriana – CEDIA Acceso al Proyecto – Telemedicina de Brasil, esta presentación, tuvo la participación local del Dr. Ricardo Hidalgo, Decano de la Facultad de Ciencias de la Salud de la UTE y desde Brasil al Dr. Leonardo Avanza, Experto en tele diagnostico de la Universidad Hospital de Espíritu Santo de Brasil. 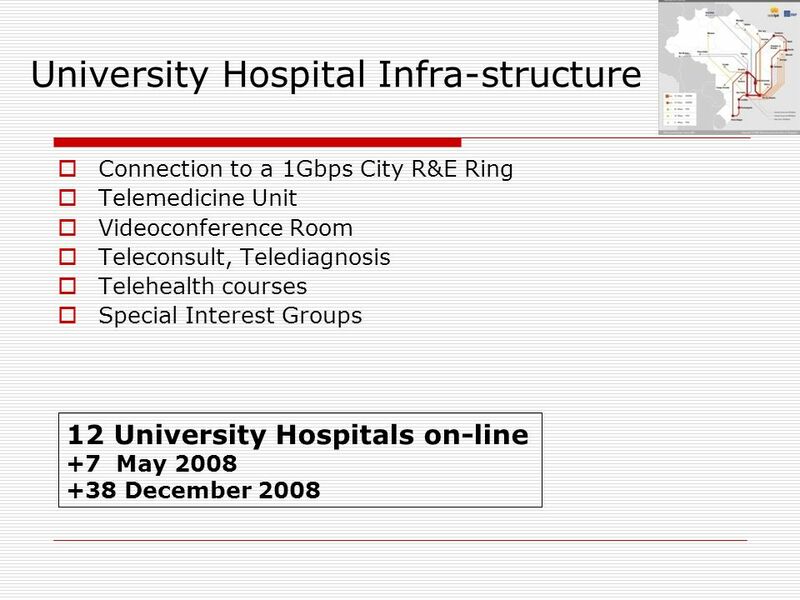 Carregar ppt "INFRA-STRUCTURE PERSPECTIVES FOR THE DEVELOPMENT"
8th Global Forum on Bioethics in Research Vilnius, Lithuania June 28, 2007 Student Perspectives on Training Programs Training program in research ethics. 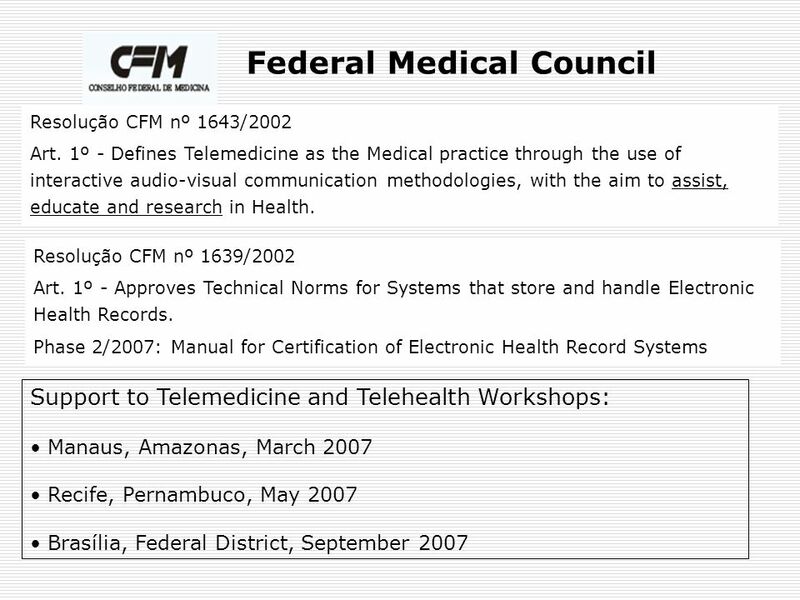 Click to edit Master title style Click to edit Master text styles Second level Third level Fourth level Fifth level 1 Clique para editar o estilo do título. 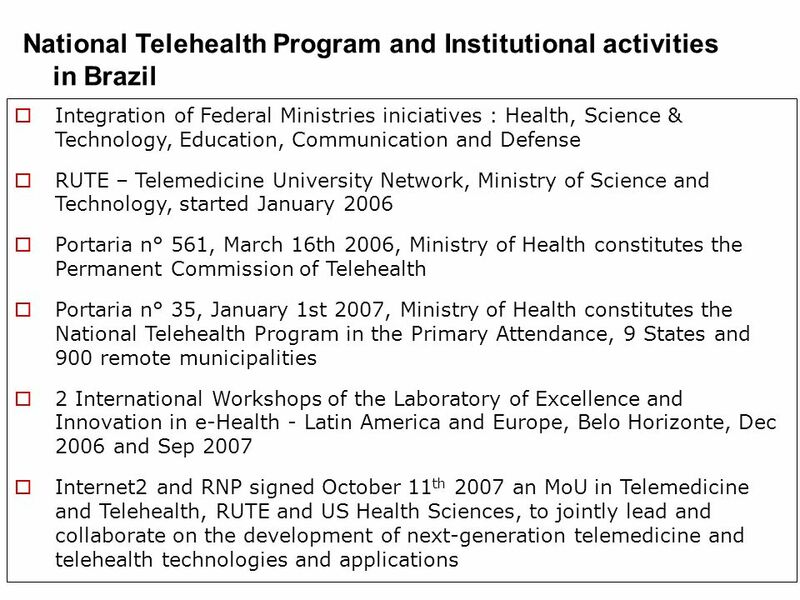 RCAAP Project João Mendes Moreira, FCCN Berlin 7, Paris, 04/12/2009. 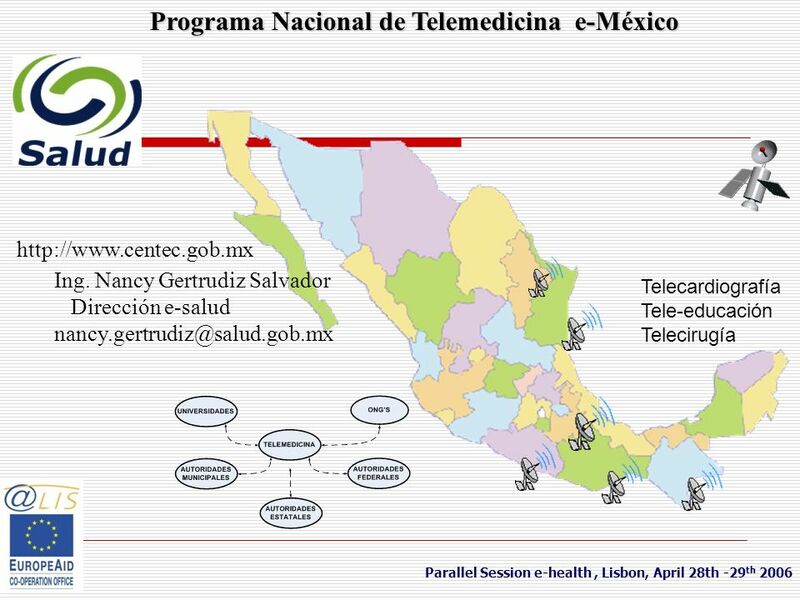 BLUE BEAUTY. 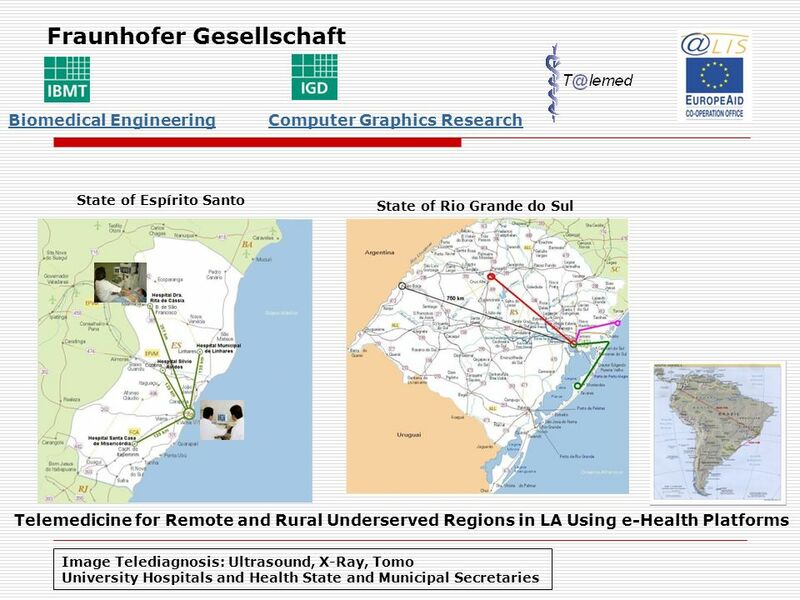 SANDSTORM LEAVING NORTH AFRICA TOWARDS THE ATLANTIC – CANARY ISLAND. 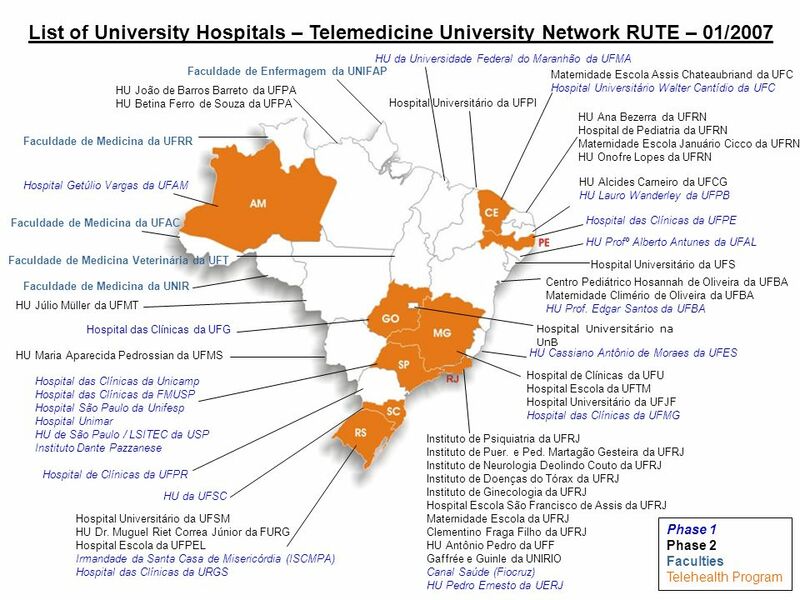 São Paulo - November 7, 2013 Measuring the Cost of Formalization in Brazil © 2003 The Ronald Coase Institute Adopting RCI methodology to measure start. 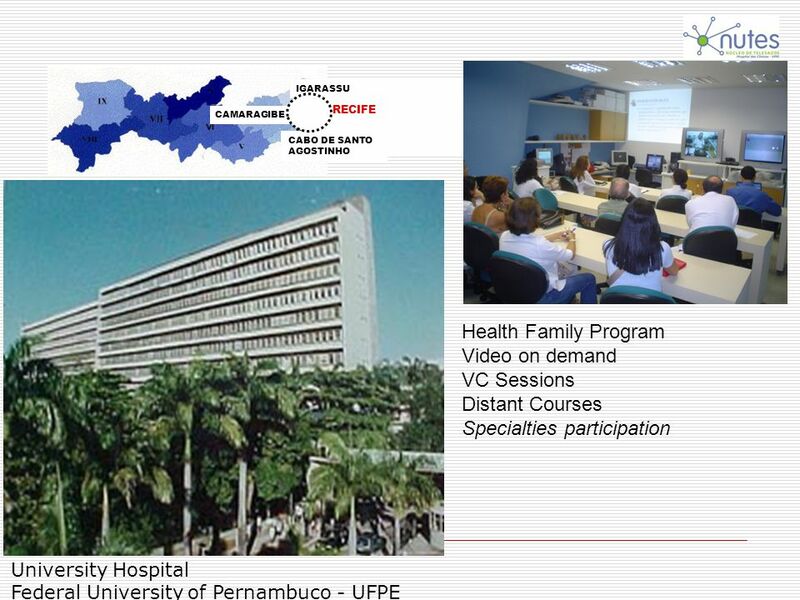 INPAs insights on LBA (and its role as the coordinating institution): (based on and the message from INPAs General Director, Dr Adalberto Val, and on former. 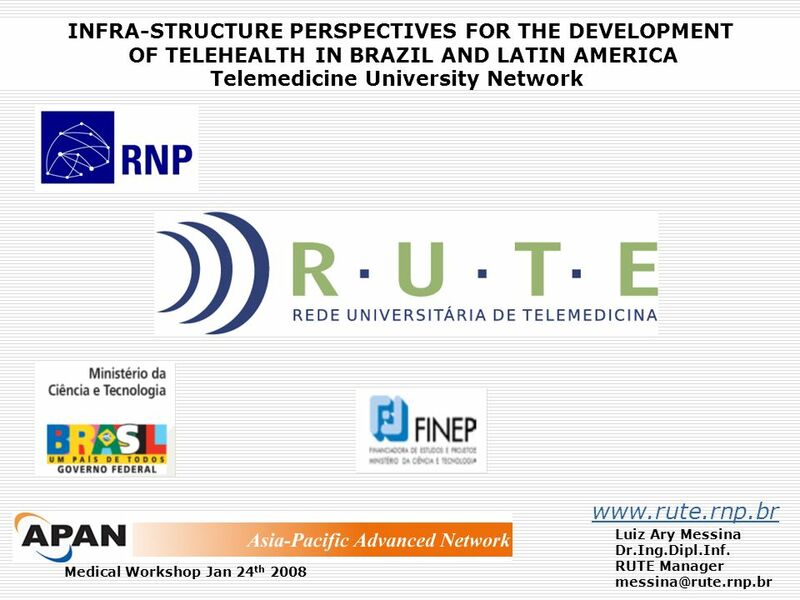 RNP/PAL/xxxx © 2004 – RNP An experiment in videoconferencing over IPv6 using Isabel Michael Stanton Director of Innovation, RNP, Brazil. 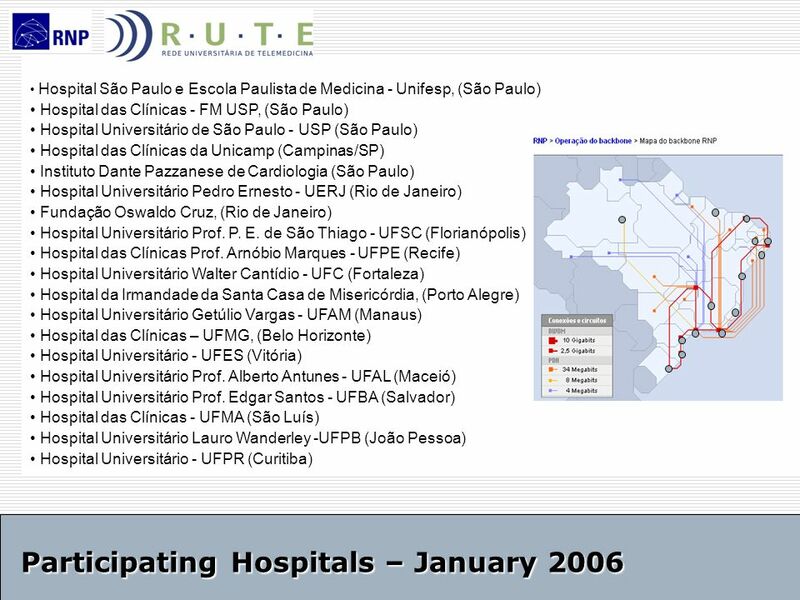 FÓRUM NACIONAL DE PRÓ- REITORES DE PLANEJAMENTO E ADMINISTRAÇÃO Palmas, 27 de março de 2009.